Paalak Paneer rice sounds very different from what I generally make . I like the idea of using crumbled paneer , it is such a pleasant change from the regular cubes . Perfect lunch box recipe ! Never thought of making this as a lunch box idea.. Brilliant... Sure to make this!! Palak and Paneer are such a classical combination. Those two with lots of nuts in the rice sounds so delicious. Perfect for kid's lunch box.. Spinach and paneer rice rocks, love the combo. But haven't tried it with rice. Great share, perfect for lunch box. Wow paneer and palak in rice... I wouldn't have thought about that combination with rice. Great idea Harini. Thanks for sharing. Will try it out. WOw, this rice will definitely please my paneer loving kid, adding spinach sounds too good and healthy as well. Lovely dish there. 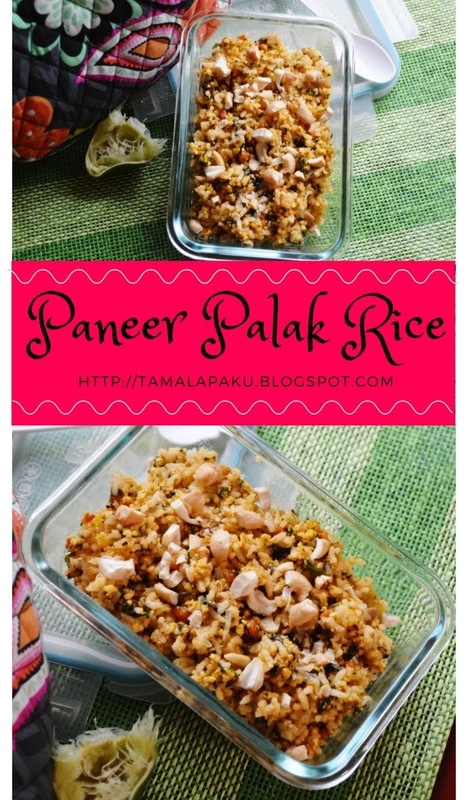 Love this new version of palak panerr rice. It can be adapted to suit anyone's taste preferences. Kids lunch box always makes me standup and notice! and if you say this is your kids favorite, then I will surely make note to try on mine..:)..
A good choice for lunch box idea as most kids love paneer and a bit of spinach added. I like the idea of grating the paneer rather than using cubes. I love the combination of paneer and palak. This rice dish sounds just perfect for my kids lunchbox too. I love palak rice and paneer rice so the combination of both in rice must have tasted just amazing. I love any kind of variety rice recipes. Perfect rice for lunch boxes! Looks delicious! I love to make such quick rice dishes with leftover rice, it beautifully awakens the old rice and gets ready in minutes too! My little one loves anything that is green and palak rice is one of his favorite. Mix the paneer and it will become one of his ever favorite one. Love it for lunch box! This is such an amazing combo and loved your idea of crumbling the paneer into the rice.. This is such an amazing kid's friendly lunch box recipe !! I made palak paneer paratha, sandwich and curry.. never thought about rice.. greeat idea and healthy too. Palak paneer gravy is something we see often,palak paneer rice sounds so different and nice too! One other way to get my kid have palak!